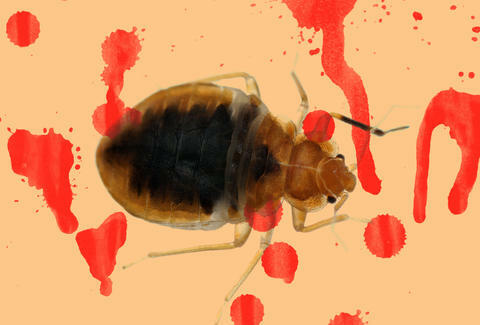 Unfortunately, the horror of a bed bug infestation is a pretty common experience in NYC. According to pest control company Orkin’s annual Top 50 Bed Bugs List, confirmed cases of bed bugs increased during 2015, making New York City the fourth-worst urban region in the nation for these pests. Local exterminators at M&M Pest Control agree. If you’re fortunate enough (ironically) to find an actual bug, be sure to catch it and put it in a Ziploc bag -- bed bugs are demonic, but they’re not very swift. You’ll have no trouble snatching one if it just so happens to plod across your pillow. By bagging the evidence, you can provide your landlord proof of an infestation -- so you don’t have to foot the bill -- and give your exterminator a sense of the severity. If evidence is exactly what you’re lacking, call a NESDCA-certified canine company. These bug-sniffing dogs can tell you whether or not you’ve got a pest problem, and exactly where they’re hiding. There are some holistic methods that have proven effective at defeating bed bugs (highly concentrated peppermint oil, for example, and straight-forward rubbing alcohol) but you absolutely want to call in an expert. “Most over-the-counter pesticides will make the situation worse by scattering the bedbugs you don’t see or that are not exposed to the pesticide,” Kollgaard warned. New York City bed bug specialists include M&M Pest Control (an eco-friendly pest management firm) and ODIN Pest Control, though nationwide companies like Orkin and Terminix have seen their fair share of bed bug outbreaks. Depending on the extent of the infestation, your exterminator will likely make two visits to your apartment, and he or she will ask you to take steps prior to their arrival. Start by clearing clutter from the infected site. On the day of the first treatment, wash all clothing and bedding in hot water (and dry everything possible on high heat). Seal your belongings in plastic bags (I recommend double-bagging everything because bed bugs are relentless) until after the second treatment has been administered. Insecticides won’t kill eggs, only bed bugs that are physically exposed to the chemicals. So don’t go putting your clothes into a dresser or under-bed storage until this window has closed. Unfortunately, it’s pretty crucial you stick around your apartment throughout this difficult process. While you’ll be tempted to flee to your friend’s apartment or a hotel, bed bugs won’t come out to feed (see above: Bed bugs must make physical contact with chemicals). Basically, you need to stay there as human bait. And then just vacuum like mad and steam-treat (or spray with rubbing alcohol) furniture and clothing that can’t be washed. Bed bugs are pretty hardy (it takes several days of zero-degree temperatures to kill them), though an hour and a half of extreme heat exceeding 117 degrees will do them in for good. Heat-treating infested homes is highly successful, but you’ll likely get an insecticide-based treatment. For an even more comprehensive battle plan, read our full guide to waging all-out war on bed bugs. Vacuuming, washing bedding often in hot water and drying on high heat, and protecting your mattress and pillows with specially designed bed bug-proof cases can prevent a stray bed bug from transforming your home into an all-night blood buffet. If you travel, it’s also recommended that you thoroughly inspect your suitcases before bringing them into your home, or even fumigating them for a few weeks in sealed garbage bags with special products (pest-eliminating strips are a smart choice). Bed bugs are insidious, and can be extremely difficult to get rid of once they’ve decided your mattress is a cozy abode. But they don’t have to destroy your life or force you out of an apartment. If you’d like to know whether or not bed bugs have ever been identified in the apartment prior to moving in, we’ve also got you. Just go to New York City’s Housing Preservation & Development site and search for your current or prospective apartment. You’ll see if any complaints or violations have ever been recorded (including pests of all varieties). And under the 2011 Bedbug Disclosure Act, your landlord is supposed to notify you if the building was infested in the previous year. That’s because (here’s the worst part) bed bugs easily spread to neighboring units. It’s particularly bad if there’s a bed bug crisis above or below your apartment: They’re notorious for traveling along mechanical and plumbing lines. We can’t say having bed bugs isn’t a total horror show. It really, truly is. But you will survive, and you may not even have to toss your duvet. And the next time you see a cockroach scurry across your countertops, you’ll feel something close to an enormous wave of relief. At least cockroaches just want to eat your food -- not you. Melanie Taryn Lieberman is a New York-based writer who likes to wake before sunrise and has thus seen a real life bed bug. Now the bed bug nightmares keep her up at night.